Steve Graves had a passion for music that stemmed from an early age. Growing up he played the guitar and bass, which led him to be part of local bands: The Keepers, Noah’s 82nd Annual Stained Glass Carnival, and The Graduates, which played local venues in and around Aberdeen, South Dakota. Steve was able to maintain his passion for music when he moved to Watertown with his wife Kaija to manage a music store. They opened The Music Tree in 1972 on South Broadway in Watertown, South Dakota. It was here that hours of talking about music and musical instruments became a way of life. Steve Graves birthed The Music Tree through his love of music, but it would not have been the music hot spot of the seventies in Northeast South Dakota without the addition of Ron Schneider and Rick Smith. 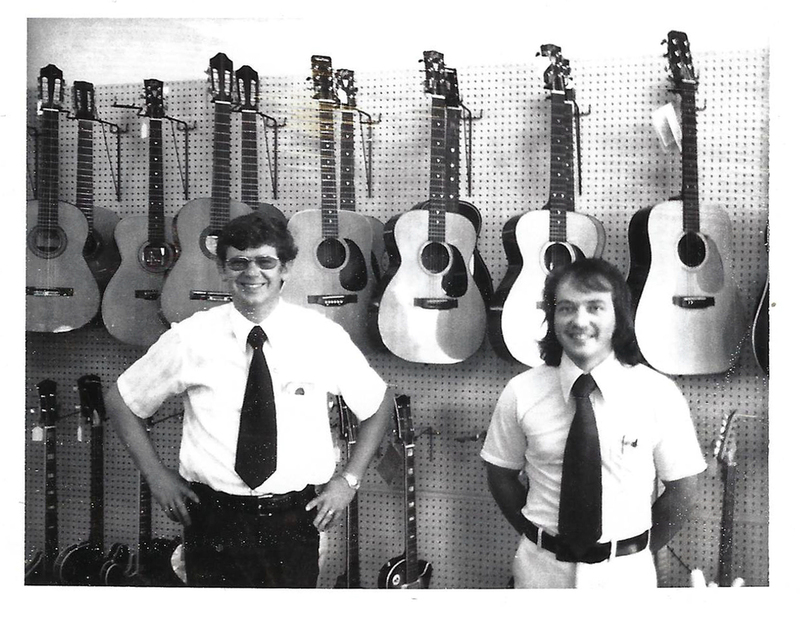 Steve and Ron combined their zeal of music with their enthusiasm for selling and went to work. Rick added his repair expertise for musical instruments, fixing equipment with precision and detail. The Music Tree was an active part of different local events like the South Dakota State Fair and Watertown Crazy Days and the Watertown Farm Show, where Steve shared his appreciation for music with the community. The Music Tree carried Kimball pianos and organs along with a full line of musical instruments, records, tapes, sheet music, and stereo equipment. The store was known for having the most current guitars and amps around: Martin, Ovation, Yamaha, Gibson, Fender, and Marshall. Even Orange amps were carried. Rockers loved this equipment and still do. Ron Schneider recalls when Sgt. Barry Sadler, whose hit was “Ballad of the Green Berets,” stopped on a Saturday and had just lost his organ player to a dispute; he was playing in Watertown that evening and needed a portable organ. He was broke and asked if we traded things. I said, “Sure, what do you have?” He brought in a suitcase, and to my surprise he had multiple guns and knives. He pulled out a Ruger P38 he had used in Vietnam. We traded! Another Saturday a bus pulled up, and a guy came into the store to look at guitars. He went back out to the bus and came in with Robby Benson. He looked at a Martin guitar, played a few licks quite well, and said, “I will take it.” He went back to the bus, and his manager came in and sealed the transaction. Robby Benson Entertainment on the receipt. The Music Tree was a lively part of the community until 1981 when the store closed. Steve Graves passed away in 1998. Rick Smith is still using his precision skills at Watertown Community Orthodontics, and Ron Schneider is utilizing his incredible selling skills at Sharp Chevrolet in Watertown, South Dakota. “Some of the best childhood memories I have of my dad consisted of watching him talk to customers at The Music Tree. He loved getting to know people and sharing his love for music. My fondest memory is of my dad playing different pianos for customers when they came into the store. There was an overall theme of joy in the store, one that was reflected on the customers’ faces when they were speaking with my father. The Music Tree was more than just a store that sold instruments and music; it was a place to belong, to share passions, and to learn about those that lived in the community,” said Tonja Graves, Steve’s daughter.